As soon as our fans caught a glimpse of the new-for-2016 Big Boy Silver one of the first questions that came up was, "When can I get an engraved version?" 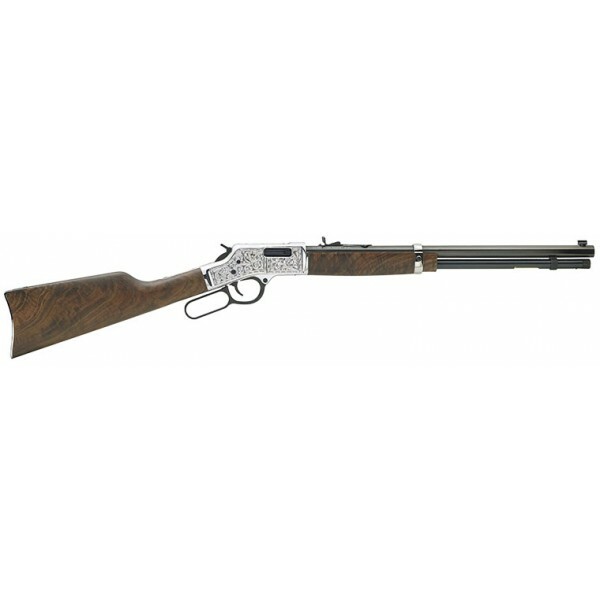 Following the great success and demand for our engraved brass rifle we now have another impressive showpiece to add to the Big Boy Family with the ornately embellished Big Boy Silver Deluxe Engraved rifle. With only 1,000 of these limited edition rifles available, we are elevating the Big Boy Silver squarely into treasured heirloom status. The extensive floral engraving patterns cover 95% of each side on the receiver, the entire frame's top flat, and the upper tang area between hammer and serial number. Engraving into a receiver that has been thinly plated won't cut it for us, so the Big Boy Silver uses a solid aluminum-bronze alloy that results in a silver tone all the way through the metal. Not only does this provide a stunning base for hand engraving, but it also means that the silver look will never fade away with time. It can be polished and cleaned up to maintain that brightly gleaming silver sheen for generations to come without fear of chipping or peeling. Like the Big Boy Classic and Big Boy Silver this rifle sports a 20" blued steel octagonal barrel, semi-buckhorn/brass bead sights, a drilled and tapped receiver, a ten-round tube magazine, and transfer bar safety system. The stocks are crafted from presentation-grade American Walnut wood. Production of this rifle will be limited to just 1,000 units of each caliber. Once they're gone, that's it!